Fish the best waters in the Mid-Atlantic! 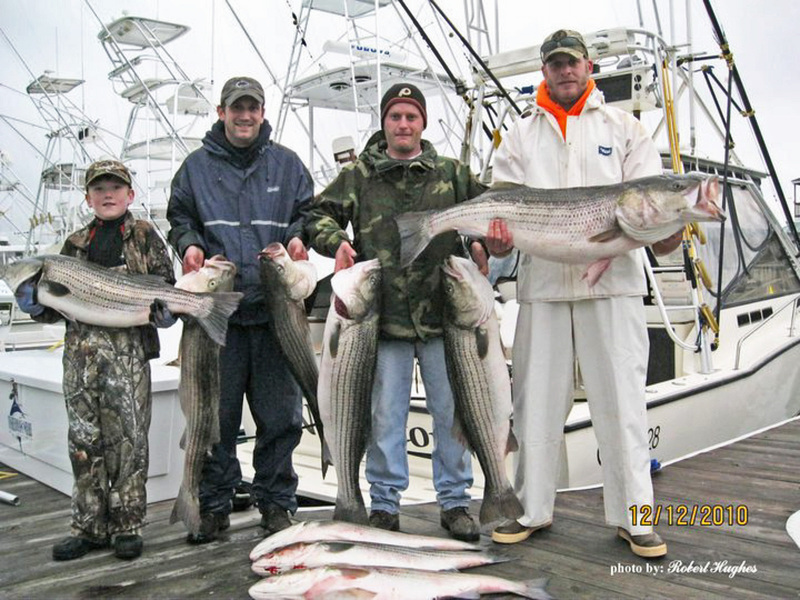 With the Labrador and Gulf Stream currents moving in opposite directions across Virginia’s continental slope, these offshore waters contain someof the most productive fishing grounds on the east coast. Dead bait trolling is the routine approach used since it is not species specific. Everything from dolphin (not porpoise) and tuna to 1,000 pound blue marlin can be captured with the same baits. Just some of our catch from a recent fishing expedition! In early May, Blue Fin begin congregating close to the Virginia/North Carolina border. By mid-June, these 30 to 70 pound fish have settled in some of the best fishing hot spots directly off southern Virginia’s coast. Fishing is very good through autumn. By mid-July, you can enjoy fishing for white marlin, dolphin, and wahoo. Large numbers of white marlin congregate on the ocean “lumps” southeast of Virginia Beach and in canyons farther offshore. White marlin fishing holds through September. Fishing for yellow fin tuna is strong in both spring and fall. There is always a chance of catching a blue marlin. Sailing out of Fisherman’s Wharf Marina in Virginia Beach VA. Email or call Capt. Jeff @ 757-869-0662 or 804-642-6300 to charter your next fishing adventure!